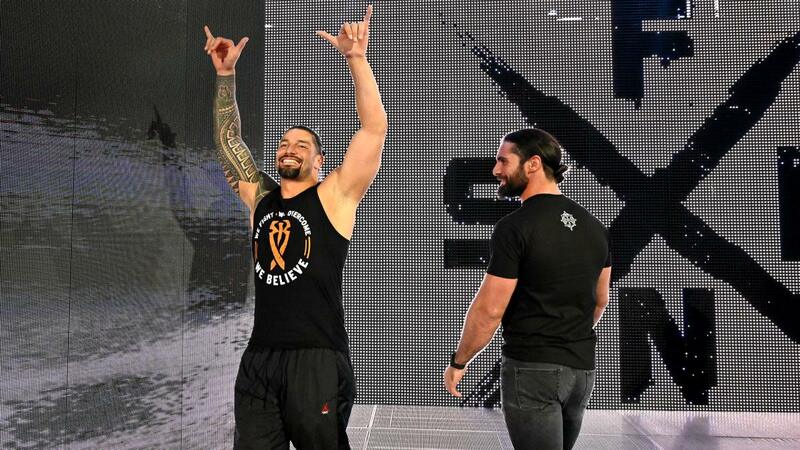 Roman Reigns and Batista both returned to WWE television on last night's Raw. Reigns opened the show and announced that his leukemia is in remission. Reigns said "The Big Dog is back" and that "we didn't just swing for the fences, we hit a home run." Reigns began and ended his speech by thanking the fans and went around ringside to shake hands and hug people. Seth Rollins came out to the stage and hugged Reigns, and they teamed up to save Dean Ambrose from Drew McIntyre, Baron Corbin, Bobby Lashley, and Elias later in the night. Ric Flair's 70th birthday celebration furthered the storyline for Batista vs. Triple H. As Flair was supposed to be coming out for his birthday segment, it was revealed that Batista had attacked him. Batista asked if he has Triple H's attention now. Becky Lynch also appeared last night, interrupting Ronda Rousey & Natalya vs. The Riott Squad. After Lynch got "arrested," Rousey demanded that WWE adds Lynch to the Raw Women's Championship match at WrestleMania. Rousey left her title belt in the ring after Stephanie McMahon refused to add Lynch to the match. Rousey said it's time for Vince McMahon to make the right decision.